Great northern beans are the largest and most popular of the white beans. These beans often resemble and are often substituted for white kidney beans due to their kidney–like shape. Great northern beans fall under the botanical classification Phaseolus vulgaris. All beans within this species are considered derived from a common bean ancestor that originated in Peru and are also referred to as “common beans”. Some of our most popular bean varieties are common beans including black, kidney, pinto, and navy beans. These common bean varieties spread throughout South and Central America by way of migrating Indian traders. Spanish explorers returning from their voyages to the New World carried these beans back to Europe during the 15th century. Spanish and Portuguese traders in turn introduced common beans to Africa and Asia. Today, the largest commercial producers of dried common beans are India, China, Indonesia, Brazil and the United States. With their mild flavor and powdery texture, great northern beans are versatile and well–suited in any bean recipe. They are a popular choice for soups, stews, and casseroles. Great northern beans can also be used as a substitute for cannellini and navy beans. Great northern beans are an excellent source of iron and folate, and a good source of magnesium, phosphorus, potassium, and copper. Like all beans, great northern beans are low in fat and high in protein and fiber. I hope you have a Happy and safe New Year. This chili is not spicy, it has a little bite, but not crazy hot. In large pot, heat oil over medium heat. Add onions and salt, stirring, cook until tender. Add remaining ingredients, stir well. Reduce heat and simmer for 30 minutes. In large pot with a lid, bring 3 cups of water and salt to a boil. Add rice and chipotle cubes, stir well. Reduce heat to low, cover and simmer for 20 minutes. 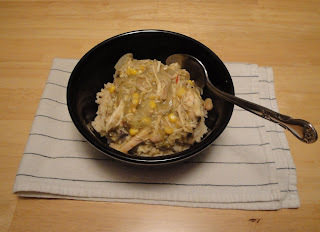 In individuals bowls, add rice and top with chicken chili. Enjoy! It's funny I never appreciated any sort of white beans until I ran across a salad that had them in a recipe...now I'm a HUGE fan! Happy New Year! Mmmm...Sounds delish! Happy New Year C!